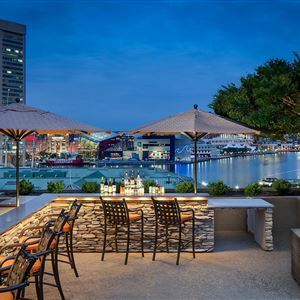 Property Location With a stay at Hyatt Regency Baltimore Inner Harbor, you'll be centrally located in Baltimore, steps from Ripley's Believe It or Not and Baltimore Inner Harbor Marina. 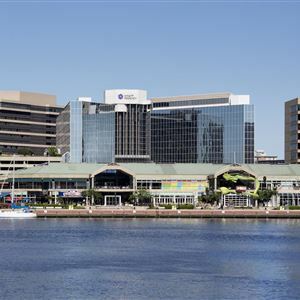 This 4-star hotel is within close proximity of Harborplace and Baltimore Visitor Center. Rooms Make yourself at home in one of the 488 air-conditioned rooms featuring iPod docking stations. Complimentary wireless Internet access keeps you connected, and cable programming is available for your entertainment. Conveniences include laptop-compatible safes and complimentary weekday newspapers, and housekeeping is provided daily. Amenities Don't miss out on recreational opportunities including a health club and an outdoor pool. Additional features at this hotel include complimentary wireless Internet access, babysitting/childcare (surcharge), and gift shops/newsstands. Dining Enjoy a meal at a restaurant, or stay in and take advantage of the hotel's room service (during limited hours). Relax with your favorite drink at a bar/lounge or a poolside bar. Business, Other Amenities Featured amenities include a business center, express check-in, and express check-out. Event facilities at this hotel consist of conference space and meeting rooms. Self parking (subject to charges) is available onsite. With a stay at Hyatt Regency Baltimore Inner Harbor, you'll be centrally located in Baltimore, steps from Ripley's Believe It or Not and Baltimore Inner Harbor Marina. This 4-star hotel is within close proximity of Harborplace and Baltimore Visitor Center. Make yourself at home in one of the 488 air-conditioned rooms featuring iPod docking stations. Complimentary wireless Internet access keeps you connected, and cable programming is available for your entertainment. Conveniences include laptop-compatible safes and complimentary weekday newspapers, and housekeeping is provided daily. Don't miss out on recreational opportunities including a health club and an outdoor pool. Additional features at this hotel include complimentary wireless Internet access, babysitting/childcare (surcharge), and gift shops/newsstands.